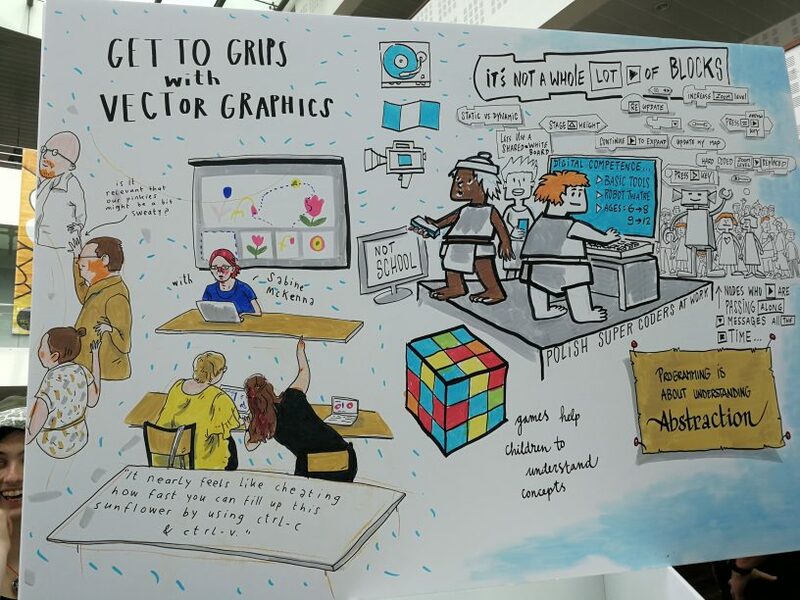 Scratch – the Coding Platform for Young People with Inbuilt Creativity and …. Community! Duo your lingo up with Duolingo! For what future am I preparing the participants of my creative computing classes? My vision is to enable them to develop their skills so they can become confident, creative, and competent digital citizens. What does that mean, in concrete terms? Plus is there anything new and doable out there that I’d love to try in my groups? 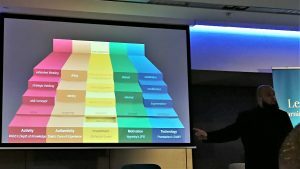 These were the main questions that I was asking myself as I went to Croke Park two days ago (3 October 2018) for the annual Learnovation conference, put together by Learnovate. Learnovate is a research and innovation centre funded by Enterprise Ireland and IDA Ireland & attached to Trinity College Dublin. There needs to be an awareness that what could be done is not automatically the same as what should be done. (Owen White, Learnovate Centre Director). That’s true for cccSkerries, too. Just that it’s possible doesn’t mean I should do it! Creativity, resilience, problem solving – those are the main skills that are needed now & will be needed even more so in the future! AIs can learn faster than humans can. Driverless cars upload their journeys (and learning), and have access to the learning of all the other cars – no human could process so much data in the same time. Anything that can be automated, will be automated (driverless cars; online systems that evaluate issues relating to insurance, tax, health symptoms…). If data is there to be crunched, it will be crunched. This could free our time up for more interesting, creative, fascinating, pleasant work! Lifelong learning is key, and it’s up to the person (employee) themselves, not to others, to identify what they should learn, and how. One challenge is to follow through once a topic / skill / course has been identified, and not to start a multitude of courses without finishing them (and then applying what you have learned!). Just giving every child a device (iPad, laptop, smartphone) does not accomplish anything. It’s not about the tap, shiny though it might be, it’s about the plumbing behind it! Some schools, like the Olive Tree School in Bolton (whose founder, Abdul Chohan, was one of the main speakers), are using technology in innovative ways that allow teachers to speed up tasks like lesson planning, evaluation, corrections while offering better-quality, more personalised learning to the students (plus easier access to information on how their child is doing to the parents). 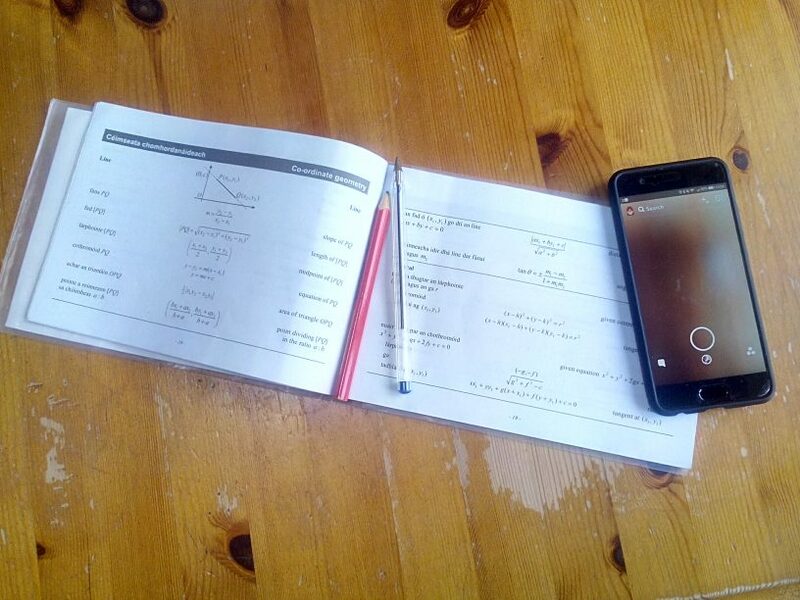 Two aspects are central when introducing technology: Simplicity and reliability! Virtual Reality is becoming more and more accessible, and as the price for headsets is coming down, educational material will be more available. Plus some of it can be accessed for little or no money (and can be seen on normal screens, too). I’d love to create 3d landscapes with my participants and then walk through them in a virtuality… Has anyone seen Ready Player One? The book is even better. I can’t wait for multidimensional 3D rigs so we can walk around in virtual reality without bumping into walls in real reality…. Currently, io is in Beta. It has directional audio, i.e. when you are all “sitting” around a table, you can “hear” where a voice is coming from, and it runs on many standard devices such as smartphones and laptops; better with VR headsets, but they are not required! Virtual reality meeting rooms could be a path for me for teaching classes to participants who are not based in Skerries (or near the libraries where I teach)… Food for thought there! The art subjects, sports, music are at least as important as the STEM (Science, Technology, Engineering, Maths) subjects! As humans, we should focus on the things that robots / computers can’t do. (Aisling Teillard, HR specialist, during a panel discussion). Plus… The heads of many hugely innovative companies, such as Facebook, Twitter, Amazon have an arts degree. Thinking, evaluating, questioning, looking at facts from various angles… all these are skills that will continue to be very important. Learning must never stop! From early childhood through all phases of adolescence and adulthood, the one thing that will be constant (and will speed up) is change. Learning some skills and facts in the first third of one’s life and then using them for the rest of one’s professional existence is a thing of the past. In order to change behaviour, it helps to understand the plasticity of the brain & how it changes when we’re learning (Celine Mullins, Adaptas). Nudges can help to change people’s behaviour… in discussions following Peter Gillis‘ talk on how this economic theory can be applied to learning, many agreed that being ‘nudged’ can be hugely annoying and even feel creepy. Who gave anyone the right to decide that I need to be nudged??? However, if you sign up to a program that includes behavioural change (health, fitness, learning a language), then the same types of nudges (emails, pop-up windows, notifications), if judged well, can be very helpful. It’s all about the why! Moving from change on a personal level to change in general (and as far as technology is concerned, in particular)…. yes, it still seems to be speeding up. That’s the message many speakers were disseminating. Plus we really don’t know what our future will look like. 2030 seems to be a key year that a lot of predictions focus on (here is one interesting selection of predictions I found). So all we can do is be ready, willing and able to change with the times while remaining true to our values, it seems! Central is the ability to understand technology – to know what tools are there; to know when to use them, and when not to use them. 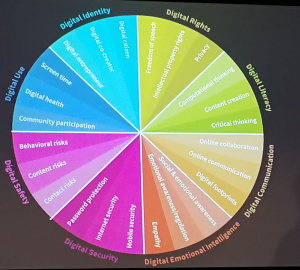 Good learning needs activity, authenticity, being invested in the subject, motivation, and technology – all of these aspects are important, and technology should not be seen in isolation. Click to enlarge! Abdul Chohan in action. This is an issue that I will follow up in a future blog post, as it is so central to what I’m doing with cccSkerries and my teaching. 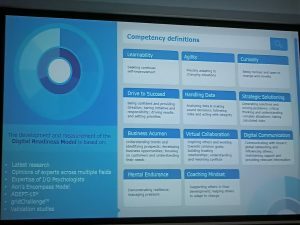 According to the Digital Readiness Model (reported by Occupational Psychologist & Executive Coach Siobhan Kelly, cut-e Ireland), we need to be able to learn, to be agile, and to be curious. So, she says… Be curious! Try new things! Break old habits! A good message for ourselves – and for the young people we work with. Could I have spent a day thinking about all these issues without attending a conference (and moving this week’s Wednesday classes for its sake)? I could have… but would I? Plus: Some of the ideas that were put forward by the individual speakers only formed themselves into a more or less coherent mosaic in my mind during the inspiring and stimulating chats I had with other participants during breaks and lunch. Being part of a learning and thinking community is invaluable, even if it’s just for a day. Ciarán and Sabine in Cambridge & Boston, Mass. We both made the trip across the Atlantic to experience Scratch where it is created… in the Massachusetts Institute of Technology. 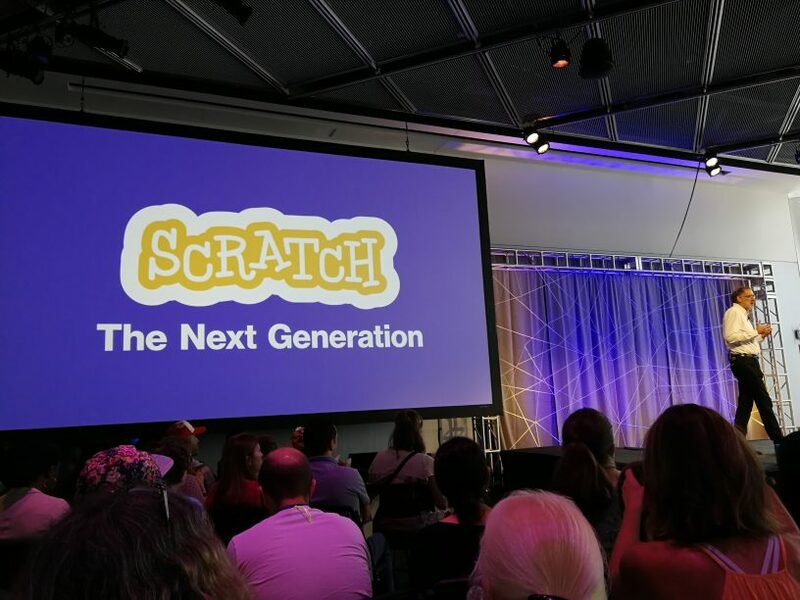 The Lifelong Kindergarten Group, led by Mitchel Resnick, at the MIT Media Lab has been creating and developing Scratch since 2003. We got to meet lots of them at the conference, as well as many of the 600 other educators. There were workshops and keynotes, an exhibition and lots of great opportunities to talk to others using Scratch. Most were educators (lots of primary school teachers, a good few secondary school teachers, more librarians than I would have expected). The Scratch Team were very much there as well, always available for a chat and very engaging and open to all. It’s back to school time, and for most parents, that means re-establishing routines. Around bed times, around getting homework done, around outside play, around proper nutrition, around limiting screen time… It can seem overwhelming. So many things to consider! Millions around the world use Scratch as their first coding experience. To learn from the best Scratch educators, to get some new inspirations, and to share my own experiences with this fantastic coding platform, I went to the international Scratch 2017 conference in Bordeaux, aka Scratch2017Bdx, this July, and I was not disappointed! 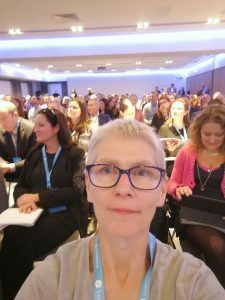 Here are just some of my take-aways… many of them will make their way into my classes with cccSkerries (in real life, here in Skerries, Co. Dublin, Ireland) and (online) with thecccCo. Use Scratch more for story telling – imaginary stories or stories based on real life (for instance, tales from a family’s history, or projects based on what is happening in the world – check out the Syrian Refugees stories created by students in a Chicago high school). Do even more with the Scratch graphics editor! … a fantastic tutorial I’ll use (again in the intermediate camp / groups) was created by a 17-year-old girl from South Africa, known on Scratch as Bubble103, who was at the conference. The next version of Scratch will run on tablets and smartphones, so more places to show off our work, yay! Keep an eye out for projects by Scratchers I met during the conference, and add more of their projects to my Scratch Studio (a collection of Scratch projects) “#Scratch2017Bdx”. Spread my love for vector graphics wherever I can, in my groups, online in the community, and through my projects with thecccco and cccSkerries! And then there is Sonic Pi, a live coding music synth. Watch it in action at the conference party here – Sam Aaron live-coding music at the conference after-party! This is a longer version of the article submitted to SkeriesNews for their 21 April 2017 edition. So you’re thinking about that summer holiday, as you would, this time of year. South of France maybe. Or Italy. Spain beckons. Or that city tour to Germany you’ve been promising yourself? Finally make it to Russia, see the Kremlin for yourself? You could probably get by with English there, but wouldn’t it be more fun to be able to understand and speak the lingo a bit? This article was published in the 24 February 2017 edition of Skerries News. What will all the developments in technology mean for our daily lives, here in this seaside town in North County Dublin? What is in store, technologically, for the next generation – what will life be like for our son, who is now 16, when he is our age? Indeed what will life be like for us all in one, two decades? That’s what I found myself wondering after attending the two-day 1st Dublin Tech Summit in Dublin on February 15 and 16. So what’s that now, paperless newspapers? Indeed. Subscribe to any of the Irish daily newspapers online, and you can read it without ever having to fold a paper again. Good for the environment, good for your purse. For the environment? Have you ever looked at the pile of old newspapers building up in the corner? No, I get that. For my purse! It’s a lot cheaper. €4 per week for the Irish Times ePaper; €14.99 per month for the Herald, €19.99 for the Irish Independent. And they all offer the first month for just one Euro. Yeah no. I tried it before and it just didn’t do it for me. Q: So what is this now, Instagram???? Can’t people just share their pictures on Facebook? A: Well, you go to Instagram to see good, interesting, fascinating, beautiful, handsome, intriguing, happiness-inducing images – mainly shot with a smart phone, and practically always square. You share them – normally not with anybody in particular, but with anybody who is looking. Whereas on Facebook you share pictures with family and friends mainly. Coding for All – Really? For a number of years, “coding” has been touted as the next big thing, the skill that our children will need in order to be part of the “smart economy” of the future; the skill that will make our youngsters rich and their parents proud, once they have created that million-dollar app. 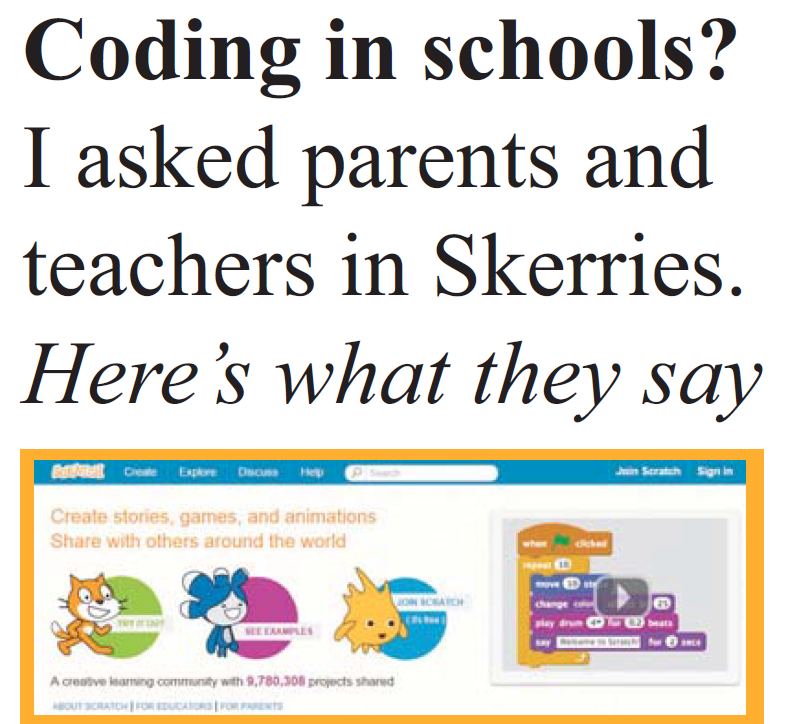 Coding clubs, so-called CoderDojos, for kids have sprung up all over the world; a number of countries have introduced programming into their curriculum, and in June of this year, the Minster for Education and Skills, Richard Bruton, has asked the Irish National Council for Curriculum and Assessment to consider approaches to introducing the teaching of coding in primary schools. But is that really necessary? Is it even desirable? It’s the time of year when holidays are on everybody’s mind. Whether you’re dreaming of going somewhere, or deciding which place to book; in the middle of planning the nitty-gritty of your trip, or getting ready to leave; when you’re actually there – and when you’re back home afterwards, Google Maps can add a lot to your vacation.